At Ronald Reagan's White House gala in November 1985, Princess Diana, 24, swanned onto the dance floor with John Travolta, 31. She in a midnight blue gown and he in a tux, it was a photo op too good to pass up. In fact, the moment became so iconic that the dress she wore is now dubbed the "Travolta dress" and has its own Wiki. Truth is, Princess Di didn't even want to dance with Travolta. Instead, she had her sights set on another, worthier partner: ballet dancer Mikhail Baryshnikov. In a documentary titled The Last 100 Days of Diana, Princess Diana's butler Paul Burrell explained that "Nancy and Ronny Regan set up the press to take a picture of her dancing with John Travolta. She said, 'I didn't really want to dance with him though. I wanted to dance with Mikhail Baryshnikov. Because he is my hero." Naturally, Travolta was over the moon to be able to cut a rug with the royal babe to music from his 1977 film Saturday Night Fever, telling Dutch station Één, "I didn't know or expect to dance with Princess Diana, and it was the president's wife, Nancy Reagan, that said, 'It is her wish.' At midnight, I had to tap her on her shoulder, and I had to say, 'Would you care to dance.' She turned around and dipped her head in that Lady Diana way and we were off for 15 minutes dancing. I'll never forget it." Hers was less a slight to Travolta than an unfulfilled wish to be seen, literally, by Baryshnikov. In Burrell's biography of the late Princess, he describes a time when Diana went to the stage door of a London theater to have Baryshnikov sign her book. He signed it "without looking at her." 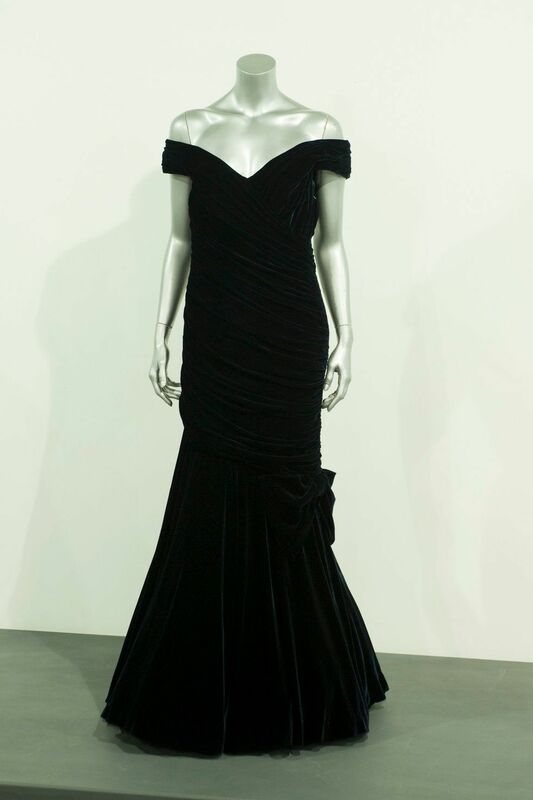 The dress eventually became the most expensive dress ever sold at auction, fetching £240,000. It was the last dress Diana ever wore in a portrait. It was sold to a British gentleman as a surprise to "cheer up his wife."